Compact PCs pose significant design challenges, not least of which is how to quietly cool a high-performance, overclocked CPU in a cramped space. 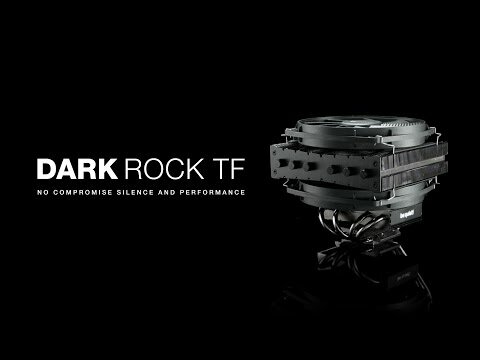 be quiet!’s Dark Rock TF offers a solution to this challenge. This top-flow cooler with two powerful heat sinks is an extension of the well-established successful be quiet! product series Dark Rock and a compact cooling beast. It is designed to bring the famous be quiet! silent technology into your PC. With the best performance-to-noise ratio available in the compact cooler category, it strikes the perfect balance between cooling and serenity with absolutely no compromise in silence and performance. • Extremely high cooling capacity of 220W TDP supports even overclocked CPUs in compact PCs. • Two powerful nickel-plated aluminum heat sinks. • Six high-performance 6mm heat pipes with aluminum caps carry heat to the optimal location on the cooling fins. • Top-flow layout enables ideal cooling not only for the CPU but also for surrounding components. - Advanced fluid-dynamic bearing with copper core. - Advanced six-pole motor for smoother operation and less turbulence. - Nine airflow-optimized fan blades. • Noise is a scant 26.7dB(A) even at 100% PWM function. • Single fan assembly and operation also supported, offering further space savings and even quieter operations. • Anti-vibration rubber inserts on the heat sink cooling fins further dampen noise. • Dark nickel-plated finish with brushed aluminum covers. • Compatibility with all current Intel® and AMD™ sockets. • 3-years manufacturer’s warranty. Features • Extremely high 220W TDP cooling performance. • Dual dark nickel-plated heat sinks with anti-vibration rubber inserts. • Six high-performance 6mm heat pipes with aluminum caps. • Two virtually inaudible SilentWings 135mm PWM fans (max. 26.7dB(A)). • Fans equipped with durable fluid-dynamic bearing and smooth 6-pole motor. • Space-saving single fan assembly also supported. • Compatible with all current Intel and AMD sockets. • Product conception, design and quality control in Germany. be quiet! Dark Rock TF, Top Flow Dual Tower CPU Cooler, 6 Heatpipes, 2x 135mm PWM Fans, 220W TDP, for Intel/AMD CPUs is rated 5.0 out of 5 by 5. Rated 5 out of 5 by JamesManchester from Cool and ultra quiet. Really impressed from the get-go with this cooler, from the presentation and build quality to its performance. Looks really nice and feels like a perfect fit for my m-atx build in a Phanteks Enthoo Evolv. Currently I have it cooling a 4670k @ 4.4ghz, on the desktop it sits around 25°C and didn't see it go above 49°C when playing the Witcher 3! Night an day different in terms noise against my old h80, can't really hear it even at max rpm. It also provides cooling to the ram modules and the m.2 ssd which is great too. As for installation, looking around some reviewers had me concerned about the mounting system, trying to tighten the little nuts from the top which looked super awkward. But HiTech Legion's video showed me how it was meant to be done and it was extremely easy to install. Highly recommended for anyone who desires silence while maintaining a decent overclock. Rated 5 out of 5 by TheReviewer from Fantastic Cooling but difficult to install I purchased this as my H60 was not cooling my CPU efficiently. This is one of the best CPU coolers I have used, first time using bequiet and they do not disappoint in the quality. Although it was difficult to install, I put the bolts the wrong way so it wasn't connecting to the motherboard correctly - if you buy this, check you done it correctly! Be aware it is quite large and just fits in my case. If you're looking for performance and silence as it says on the box, this is the CPU cooler you want! Is it compatible with socket 2011-3 (x99) ? Would this fit an Aorus z390 Extreme motherboard? I'm thinking of pairing this with a Gigabyte Aorus z390 Extreme motherboard. Would the cooler have clearance considering the z390 extreme has some big VRM heatsinks?